Artes de Cuba: from the island to the world. 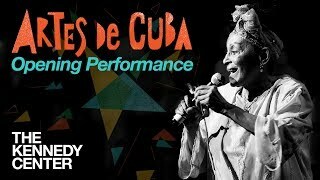 For two weeks this spring, the John F. Kennedy Center for the Performing Arts will present Artes de Cuba: From the Island to the World, a festival celebrating the artistic richness that has emerged from this "island archipelago in the sun." This unprecedented gathering of Cuban and Cuban-American artists represents some of the world's greatest from the island and the Diaspora. Watch highlights, full performances, and artist profiles from Artes de Cuba. "Cuba is host to a mélange of cultures—African, European, Caribbean, North and South American—that has shaped Cuban art for half a millennium."